People are often confused by the actions of Aquarius zodiac, but they know exactly what they’re doing. This is how Pluto in Aquarius is able to move forward in their own way and accomplish their goals. They go against conformist tendencies with their original ideas and constantly demand change and evolution. Pluto in astrology represents co-operation, healing, elimination, rebirth and generational changes. 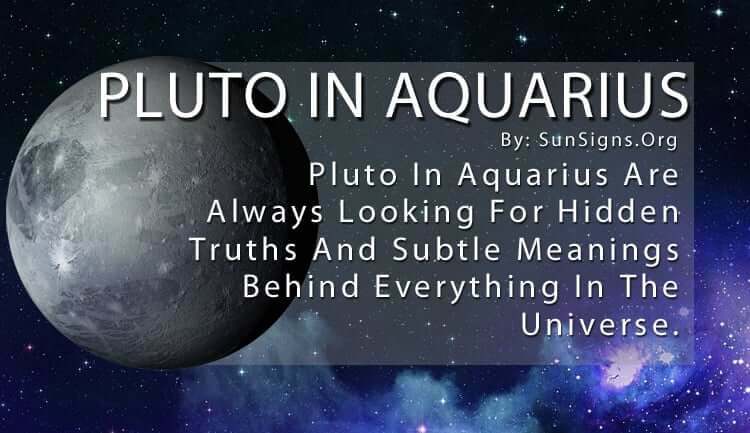 Because of their intellect and constant curiosity, Pluto in Aquarius is always looking for hidden truths and subtle meaning behind everything in the universe. The best part about Pluto in Aquarius is their desire to do good in the world and for others. Their humanitarian efforts have the ability to bring about important changes in society, for they believe you can improve upon any idea. The Aquarius Pluto zodiac sign hate to see any kind of injustice in the world, for they feel there is a solution for everything if you can think outside the box. They desire change, which fits in well with their capability to go with the flow. As long as they are the ones who are eventually able to control the direction of change, they will demand it every time. Their unending search to find out how everything works bring about more questions in need of answers, and they feel they have the knowledge to find those solutions. Try this planet in signs calculator. The Pluto in Aquarius isn’t satisfied with traditional definitions and explanations, so they spend their own time and resources on researching whatever topic interests them at that time. And once they become interested in something it can quickly become an obsession. They have a tendency to get so involved in their own research they can either leave people behind or run right over them in their search for the truth. If they are to grow and develop as a person they have to learn how to work well with others. While the Aquarius men and Aquarius women dislike rules and boundaries, they will have to learn how to function within certain limits. As long as they understand there are other people willing to go the distance for the same social issue, they might be more accepting of their offer to help. And outsiders will have to adapt to the work and thought process of Pluto in Aquarius because they are the most unconventional people to work with. Their ego is what keeps them on track, for they feel they are one of the few who have the capability to create positive change. But being the social butterflies they are, Pluto in Aquarius do need other people to bounce their ideas off of to determine whether or not they will work. In this sense, they create their own “dream team” to help. This is the only way that Pluto in Aquarius struggles to control the situation – when they believe they have the right solution. They make sure their theory is solid before implementing it, but because they are so protective of it they don’t trust anyone else to execute it. This can make it difficult for them to get something off the ground, and that’s where they have to learn to delegate authority and accept aid. Their brilliant mind shines through in everything they do and helps to inspire others to do more with their lives. That’s how social movements begin. Click here to find your Pluto sign.